EEF, the manufacturers’ organisation warns that nearly half of the UK’s manufacturers remain concerned about their ability to access skills post-Brexit, according to a new report. The slump in job applications from the EU has slowed since last year, but 17% of companies saw a drop in applications from European citizens. In addition, a further 13% of manufacturers still report an increase in EU workers leaving their businesses. Many of those employees are returning to the EU permanently, with companies struggling to recruit suitably skilled staff in the UK. 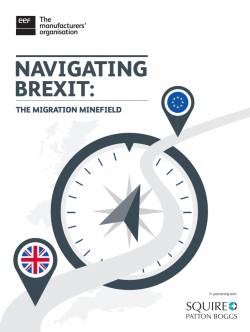 The report, “Navigating Brexit: The Migration Minefield” published by EEF, The manufacturers’ organisation and global law firm Squire Patton Boggs, calls on government to move swiftly to give companies and their workforce increased clarity over the future of EU citizens working in the UK to stem the outward flow. Proper guidance for EU workers seeking settled status would do much to mitigate this problem, according to the report. Four in ten (39%) of manufacturers need support in understanding the ways to support EU employees to gain residency/settled status and 68% want guidance on what the changes after March 2019 will mean for employers and their EU employees. Tim Thomas, Director of Skills and Employment Policy at EEF said: “Skills shortages are endemic in manufacturing and engineering and companies are becoming increasingly concerned about their ability to access the skills they need post-Brexit. While the slump in job applications from the EU has slowed, there is still much to be done to make sure UK businesses are still able to attract the very best talent from Europe over the coming months as we proceed towards our exit from the EU as well as retaining that talent after Britain leaves the EU.